The Internet of Things (IoT) is a growing trend populating the world with billions of interconnected devices that relate to physical things, ranging from wearable sensors to smartphones and smart cars. Health experts are increasingly taking advantage of the benefits these technologies bring, thus generating a significant improvement in health care in clinical settings. In numerous ordinary users are helped to improve their health and are being served from the advantages of the M-Health (Mobile Health) applications and E-Health (health care system supported by ICT). Although the IoT has the potential to enable innovative new services and simplify communication between people and objects, it also brings new security and privacy challenges. In this scenario, the conveyed medical data could be routed through a trusted / untrusted network stored in cloud service, potentially exposing privacy-sensitive data to cyber-attacks. The aim of this project is to develop an architecture based on ontology capable of monitoring the health to transmit the data to the remote server and to prevent cyber-attacks. Based on the secure attribute in Health monitoring systems provides the legitimate access to the registered and unregistered users. With the help of secure attribute based health monitoring systems sharing scheme using selective disclosure of attributes, which satisfies the security requirements. Niranchana K J, Vanitha M, Muthu Lakshmi S, Jameer Basha A. "Secure Attribute Based Health Monitoring Systems on IoT." 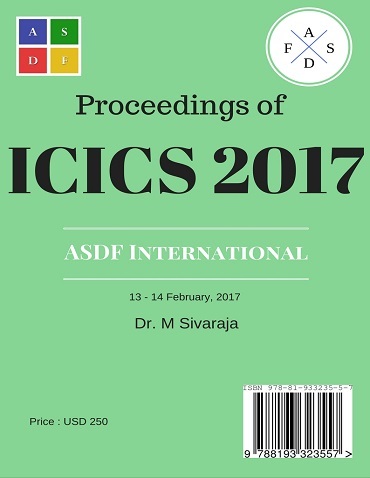 International Conference on Intelligent Computing and Systems (2017): 35. Print.